Whether you are a restaurant, bar or pub - whether a chain, franchise or independent - Epicuri works in virtually any scenario. Menusifu POS system is data driven to help establishments better understand how their business is operating. 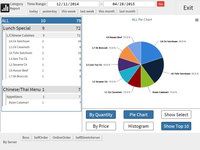 Restaurants can get indepth metrics on sales, inventory and labor with Menusifu.